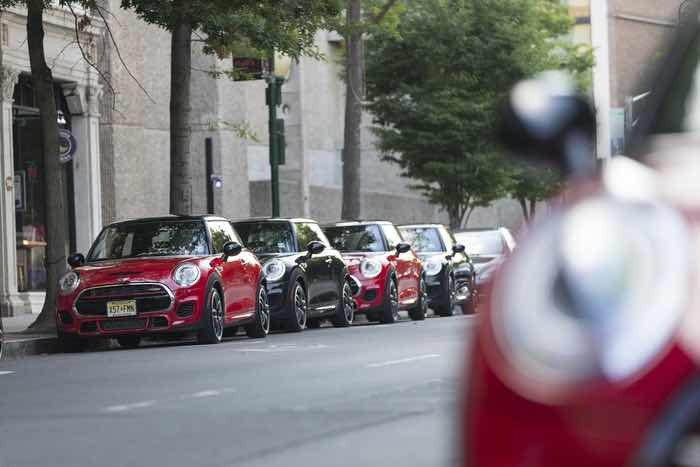 2015 JCW Mini Hardtop Americas Launch Event. On this, the **10th ANNIVERSARY** of White Roof Radio, we are joined by our good friend AJ on her way to the Mack. Then, we talk about the Top Gear boys heading to Amazon Prime, MINI on the Mack, recalls and Alex recaps his trip to Lime Rock and his time in the new F56 JCW. Plus, don’t forget to check out [iamnotwearingpants.com](http://www.iamnotwearingpants.com) to check if you have any outstanding recalls on your car. Oh yea, and bunny girl. And, yes, 10 years ago TODAY we released the very first episode of White Roof Radio. Over 700 unique shows, interviews with the who’s who in the MINI Community, events and owners that we have met along the way. No way, NO WAY, we could have done this without you guys. Seriously. Also, no way, NO WAY, I could have done this without Gabe, Nathaniel, Chad, Micheal and Alex. I’m working on fixing the archives and the feed to make it easier to find the older shows that these guys helped to make awesome. And, for sure, no way White Roof Radio would be what it is today without our man Todd. Every week he tolerates my crap and puts together **the highest rated and longest running independent Podcast on the planet**! No way I would still be doing this if it wasn’t for him. Thanks for listening. Thanks for subscribing. Thanks for supporting us. And, most of all, thank you for listening to us talk about MINI Cooper Stuff (like we like to do) every week. Stick around. We have some amazing things on deck. Sure, it’s been 10 years but we are just getting started! so proud of you and the rest of the guys … so glad you have managed to stay “in the loop” and keep us mini maniacs updated on very crucial mini info …. thx for your hard work and never ending enthusiasm ….